I thought I would throw it back today, and share a few photos from the days before Wylla, when dear Drewey ruled the roost. 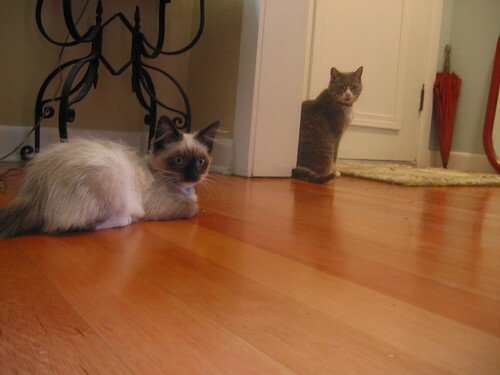 Drewey was around 13 and very used to being an only cat when wee Bean moved in. Bean tried very hard to be her friend, but Drewey had very little patience for her kitten antics and did her best to ignore the situation. 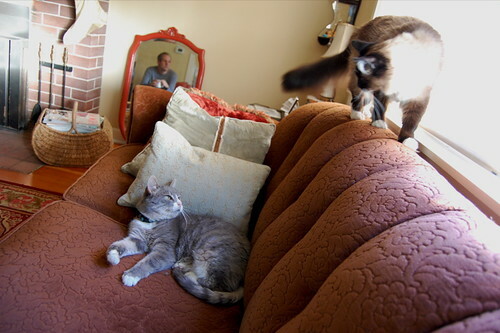 As Bean became less kittenish, a mutual respect developed, they learned to coexist, and we lived without tension. 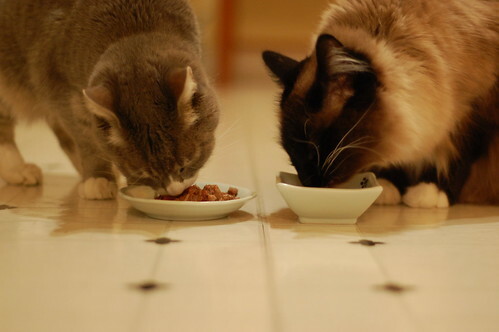 At times they even seemed to bond a bit - usually over a shared meal. Charlene and Drewey didn't have a friendship quite like Charlene and Wylla have, but they were sisters, and on some level, there was love there. Awww, sweet Drewey. I hope she's frolicking in the catnip and eating lots of foul-smelling seafood entrees in heaven. I adore Drewey. There's nothing more darling than a happy kitty making a grumpy face. Drewey was such a beautiful little lady. I love Drewey. She was a beauty! The "Say What?" picture and the one of the two "cuddling" on the red chair are two of my all-time favorites! Love Drewey. 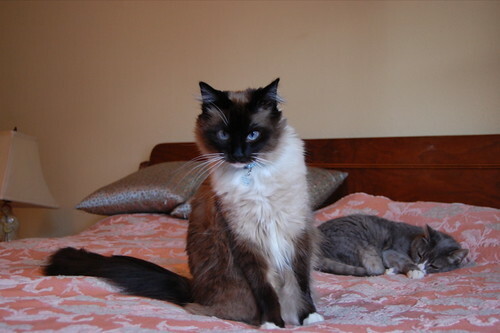 Someone on another blog today referred to a "vintage model cat". Such a great phrase and very representative of dear Drewey. Drewy was such a dear kitty. I miss her 'inner crank' attitude. Drew was the Maggie Smith, or perhaps the Judi Dench, of cats. I'm sure she's holding court somewhere right now. Loving "The Look" on the red chair. Not unlike one Beanie gave Wylla. Thanks for more Drewey Junebug stories and pictures. How did she come by her name? And same question for Charlene. I do love a good naming story. Doubleday was named for my mom's fav publisher and being a double to Benjamin Britten. Badfinger? 19 white toes and one black one...in the middle. Drewey came with her name, we didn't pick it. I did add the Junebug later. As for Charlene, it just fit her. 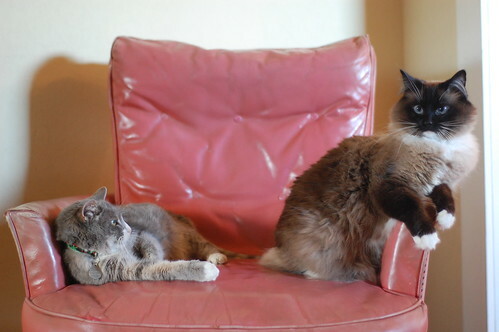 The two on the chair is definitely an all-time classic cat picture. And the first one is always funny to me. I love it when cats are like, "What? I'm not doing anything. I'm definitely NOT looking at her funny. I'm just sitting here!" I love the throw back Thursday for the site. Drewey was such a sweet looking cat, even when embracing her inner crank. Her white nose and muzzle were just so special with that dear pink nose. Love the shot of young Bean getting the over the shoulder glare from her big sis. Drewey was so cute! It's great to see photos of these two, and I can never get enough of kitten Bean photos. I particularly love Bean's come hither eyes in the second picture. Awww Drewey sweet girl <3 and baby Bean is so great. Ohmigosh, young Butterbean! Giving us the same look Wylla does now. I was just reminiscing about Drewey and describing her to a friend of mine. I have been 'flashing back' to memories of my departed Toes. And feeling uncertain about Marbles and her time with me. Thank goodness I have the IBKC and their leader Charlene and her minion Wee Wylla. Yeah, it took a while for my two female cats to adjust to each other. When my male cat passed on two years ago, they just had each other and myself. Now they occasionally play with each other and don't fight as much. I sure Beany misses her big sister sometimes. Thanks for the memories. Thanks for the memories, Drewey was a sweet girl!! It really is the circle of life going on now with Wylla and Bean, just lovely.